1) How comfortable you are viewing your pics on the computer? VERY, I'm looking at my pics ALL the time. I have a laptop and a desktop, plus pictures on my phone. I store photo albums on my iPod touch (now switched to LOM category albums). I just downloaded the Shutterfly app for my iPod so now all of my archived highlight folders are available to me in a click or two. 2) How others in your life view your pictures? I blog, I upload pics to facebook, I txt and send pictures, I email photos and I send out at least a Smilebox or two a month. My kids also know how to view the pics that are currently on the camera. She will also let me know which pictures she would like printed for her scrapbook. 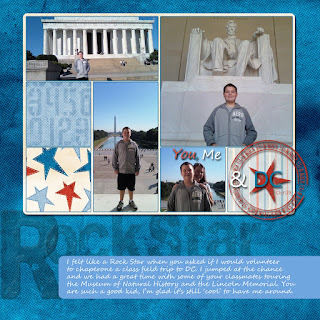 Completed layouts get printed in Shutterfly books after every 20-30 pages. Immediately after completing a page I print a smaller version to hang in my Wall O Photos display on the entrance wall. Plus I have an entire shelf of completed albums on a bookshelf in my studio that everyone looks at regularly. 3) How you organize? Where do you put down your to do's and tasks? Your grocery list? Your notes? To do's either go in my ipod, or my cell and everything gets consolidated into OneNote on my computer. Same goes for layout ideas, theme album ideas and family requests. I would like to say I'm 'paperless' but I'm not quite there yet. Although I do religiously print the handouts, etc for my clipboard and LOM binder. 4) Where do you scrapbook? Wherever I want, whenever I can. I have a laptop and like to be completely portable. I've done pages on trains, planes, in the car (while a passenger of course), by the pool, at the beach, in bed - you get the picture. I love the no clean up aspect! My laptop had to be fixed a few weeks ago and I was so miserable being tied to my desktop in order to scrapbook. I like to be in the middle of the action, to know what my kids are up to, and they put their two cents into whatever page I'm working on. 5) How often do you print things when you are working with them? Never. I do however do a lot of zooming in and out on PSE to make sure things are lined up, spelled correctly, etc. 6) Storage Space and Cost- How will you use the pics once taken? How much storage space do you have? How price factors into your budget? I rarely print pictures other than completed scrapbook pages. I'm fortunate that storage space isn't a problem, but I think that's because all of my scrapbook supplies 'fit' inside my computer now :-) Price is definitely a factor because I don't want to waste my money, but I'm certainly open to finding new options, that's why I 'm taking this class. Once I take pics, I download to computer, then upload to S Fly. About once or twice per month I make a smilebox to share electronically. 7) How organized do you currently feel? Why you are taking this class? How confident are you that you can adapt the system digitally and keep the principles and make it work? I love the system that Stacy has designed and have been asking specific questions in order to make it work for me. I'm confident that this system will stay with me as I can already see the benefits. I'm still trying to figure out how all of the pieces work together, but I'm going to wait until I have all the information before I make any final decisions. Eric's baby shower was a success! My sister was totally surprised and got incredibly spoiled. I'm so psyched for her and still can't believe that my baby sister is having a baby! With all of the hard (yet fun) work I've been putting in these last few weeks to really get the Library of Memories system working I thought it would be rewarding for me to capture all that I've accomplished so far. I have skipped around a little bit based on what I was inspired to scrapbook. I am 100% digi now but am also dealing with a plethora of prints from before 2002. So far I am completely done tagging, highlighting and uploading 2002, 2003, 2009, and 2010 to date. I've also done SB for printed pics for 1983, 1984, 1985, 1986, 1990, 1991, 2000 and 2001. The rest of my pictures are sorted by decade and by year from 1970 on. I also have some heritage photos that are all together in one box. All of my pre 1990 stuff has been moved back into another room as it was just overwhelming to look at everyday. But I am currently living with everything from 1990 to present and working through it. I have about 450 digi layouts and 50 paper layouts from 2002+ that I plan on rearranging into my LOM categories. About half of the digi layouts are already printed as single pages, and half are printed in Shutterfly books (so I'll have to reprint those as pages in order to incorporate them into my library). The 250 printed that I have to work with are already sorted into piles for volumes and sections awaiting the arrival of my new WRMK albums (can't wait til they get here!!! ) I was even able to use 50% off coupons to order them, so I'm super-psyched about that as well. 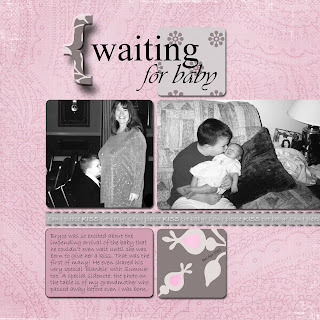 I have my volume and section page designs completed but have yet to add pictures to them. Since I was able to find the adorable Buttercup yellow leather binders, I will have to re-do the color scheme to match. I originally didn't understand the need for those pages but doing them really helped me solidify the sub categories, so kudos to Stacy Julian's LOM once again. I've also finished some ideas from PF, as I created my "Start Here" jar already. It is sparkly pink and brown with cupcakes on it and makes me smile every time I look at it. As in Stacy's book, I purchased acrylic photo frames for the doors of the kids' bedrooms and have printed out layouts and signs that say Bryce's Room & Summer's Room. They are very excited since those pages showcase pictures from our fun family vacation at Fleeton we took last summer. I am so happy with the progress I've made and can't imagine how I used to scrap without this system!! Being true to my scrapstrong pledge, I asked my friend Stephanie, if the current location of my scrapbook albums was a good one. She's a good friend, so I got an honest answer from her. She told me, they looked very nice and neat all in a row on the bookcase. BUT, even though they were in full view of anyone entering my home - they were technically "in my office" (which doesn't have a door) - they seemed to require an invitation to look at them. Sooooo, now I am taking that bookcase moving it to a more central location so our family library will be out in the open, viewable and accessible to everyone that comes into my home! I am preparing for both Summer's birthday party in a few weeks and her Communion in May when loads of family and friends will be visiting the house. I am excited to see people help themselves to the shelves! The bookcase will also conveniently provide a place for a digital frame to sit in full view as well. I love LOM, thanks Stacy!!! I am still able to end this post on the upside even though my laptop is on the fritz and won't be fixed until this weekend because I know that even though I'm not physically making a page right now, I'm still doing the things that are important to making sure the right memories are being preserved and I'm able to breathe a GUILT FREE sigh of relief. Just last night I went to bed thinking how lucky I was to be able to be home with my kids and take care of my family. Then the mathematical part of my brain went to work as it usually does. These are the calculations that ran through my head... for the last month, with the exception of some weekend days, I have been able to bless each of my family members with at least 21 breakfasts, 21 lunches and 29 dinners. Almost every day I am the 6th 'person' to eat breakfast, that is if I remember to eat breakfast! By the time it is my turn there have already been breakfast and lunch shakes for both Bryce & Keith. It's typically cereal for Summer, puppy chow for Lady and a sprinkle of flakes for the fish. I do this each and every day with a sense of wonderment at how my life has turned out (granted I would rather not have the first meal call at 6:30 am but there's nothing I can do about that :-) Then much to my surprise, my sweet husband (who works two jobs to allow me this luxury) and my darling daughter brought ME breakfast in bed complete with a hot cup of coffee just the way I like it. What a way to start the day! I suppose I won't forget to eat breakfast today. In my own true, crazy fashion whatever I read about I tend to do...so I started reading about organizing and cleaning. I know, you are probably saying to yourself, why on earth would someone need to read about cleaning. Well, I suppose that is me. If I want to do something better, or faster, or more efficiently I grab a book, google it, subscribe to a magazine or blog feed - I've come to terms with it that it's the way I'm wired. What I happy to report is that I found this great website called FLYlady.net. She must be able to read my mind because all of her stuff totally makes sense. Now a side note, even though I am quite certain that my Mom is my biological Mom, there are just some things about us that are wired quite differently. And cleaning is one of them. My mother has this superpower of sorts, that she can go through a room and completely dismantle, clean and reassemble it after spending consecutive hours or days on the project, whichever is appropriate. Bravo to her, but unfortunately I did not inherit that marathon stick-tuitiveness gene. I tend to get bored easily, with everything, not just cleaning. So I have to mix it up a bit and spend a little time here, a little time there. So Mom if your reading this, you may as well stop because it might just drive you a little bit crazy, LOL. Enter the FLYlady...thankfully, there seem to be other people out there that suffer from the same affliction and she was one of them. So I get daily emails from her site that encourage me to do projects here and there, and wouldn't you know it, it's working! My Mom always told me I needed a routine, and although I never disagreed I never really got one either. So now I'm trying to get one! I've also discovered that just as much as crud can start to creep around, so can 'clean'. Now, my shiny sink, has turned into shiny counters and it's spreading all over my house. I now understand why my mother would always clean the kitchen before she went to bed, because when I came down to a clean kitchen this morning, I could swear that my sink smiled at me. In taking my class, Library of Memories, I am finding photo connections that I absolutely love. My latest discovery was of Bryce awaiting the arrival of his baby sibling (as we did not yet know she was a girl.) We were at my brother's wedding in January of 2001. I was as big as a house, since I was 7 months pregnant. Bryce and I were sharing a dance and just as someone snapped the picture, he kissed my pregnant belly. Awwww, I know he is just too cute. I knew I had to scrapbook that picture! Then I found another picture of Bryce kissing the baby, this time after she was born. It just shows his innate sweetness and I love the sentiment that goes along with it. Each morning, as a dutiful stay-at-home mom, I get up at 6:30am to get my middle school son up and out the door. We enjoy some basic morning chit chat and he has told me on several occasions that he feels lucky that I get up and serve him breakfast and pack his lunch each day. Although I am not a morning person in the least, I enjoy this one on one time with him, even if most of our conversation is one-sided in that I'm prodding him to get ready. (He has inherited my night owl tendencies as well). This morning was a little rushed, as some mornings inevitably are and of course, the more rushed we are the more likely it is that a task that usually takes him one try, takes a little longer. So, after many iterations of "please hurry, you are going to miss the bus", my darling son was finally crossing the threshold of the front door. As I started to breathe a sigh of relief (since I could hear the bus lumbering down our street), I prepared to watch him make his way down the driveway and up the block to the bus stop as I do each day. Just as his foot hit the second step of our porch, he spun around and exclaimed "Wait, I forgot something!" Quite fortunately for me before I could launch into another chorus of 'hurry up', he ran up the steps to give me our traditional morning hug and kiss which had been overlooked in our rush to get out the door. Just as quickly as he appeared, he turned on his heels and ran to make the bus in time. Even as I write this many hours later, my eyes are welling up at how lucky I am to have a son (an almost teen, at that) that still feels it's important to give his Mom a kiss and hug before going to school.